Feel like going down memory lane? Here are the strips from today’s…strip. nice, josh. this reminds me of old Simpsons episodes. @danielle You flatter me with the comparison. Yeah, I really like how the included the 2010 Maggie. Really awesome josh, I have been reading PVP, he has been drawing since 1998 and I just started reading them a month ago. 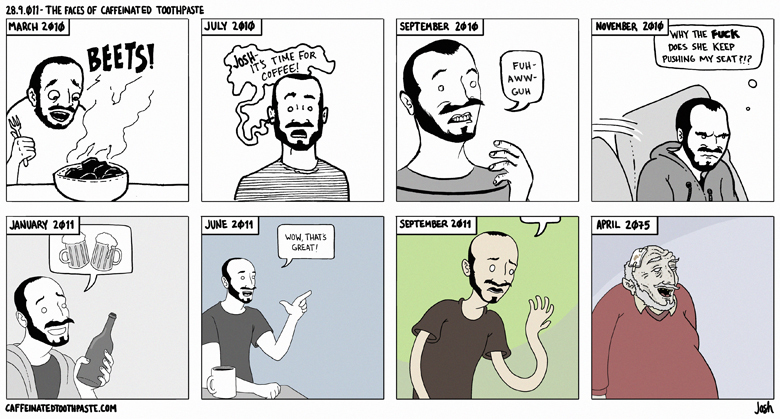 I made it through the 13 years of the strip in a few weeks, it was really cool to watch the drawing style change. I kept having to flip back and forth to see the comparisons, it is cool that you just saved me the time and created one strip to rule them all…. Very interesting to see the progress in terms of style. Personally speaking, the mood in your current strips feels “brighter” than in the earlier ones… Perhaps due to the your skillful application of colors.